1.Remove duplicated translations (some systems produced duplicated rows, i.e., identical source and target words, POS and confidence degree). 2. 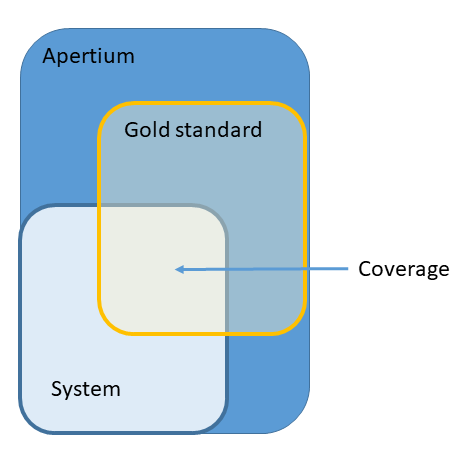 Filter out translations for which the source entry is not present in the golden standard (otherwise we cannot assess whether the translation is correct or not). Let’s call systemGS the subset of translations that passed this filter. 3. Translations with confidence degree under a given threshold are removed from systemGS. In principle, the used threshold is the one reported by participants as the optimal one during the training/preparation phase. Baseline 1 [Word2Vec]. The method is using Word2Vec  to transform the graph into a vector space. A graph edge is interpreted as a sentence and the nodes are word forms with their POS-Tag. Word2Vec iterates multiple times over the graph and learns multilingual embeddings (without additional data). We use the Gensim Word2Vec Implementation. For a given input word, we calculate a distance based on the cosine similarity of a word to every other word with the target-pos tag in the target language. The square of the distance from source to target word is interpreted as the confidence degree. For the first word the minimum distance is 0.62, for the others it is 0.82. So multiple results are only in the output if the confidence is not extremely weak. In our evaluation, we applied an arbitrary threshold of 0.5 to the confidence degree. Baseline 2 [OTIC]. The One Time Inverse Consultation (OTIC) method was proposed by Tanaka and Umemura  in 1994, and adapted by Lin et. al  for the creation of multilingual lexicons. In short, the idea of the OTIC method is to explore, for a given word, the possible candidate translations that can be obtained through intermediate translations in the pivot language. Then, a score is assigned to each candidate translation based on the degree of overlap between the pivot translations shared by both the source and target words. In our evaluation, we have applied the OTIC method using Spanish as pivot language, and using an arbitrary threshold of 0.5. Table 1: averaged systems results. Results per language pair have been averaged for every system and ordered by F-measure in descending order. Table 3.1: Results for Baseline1-Word2Vec with variable threshold. Table 3.2: Results for Baseline1-OTIC with variable threshold. Table 3.3: Results for Frankfurt with variable threshold. Table 3.4: Results for LyS with variable threshold. Table 3.5: Results for LyS-CA with variable threshold. 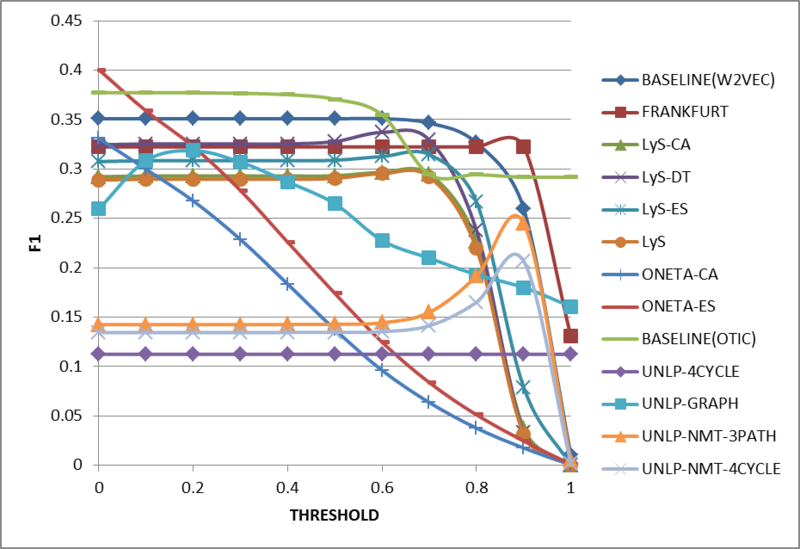 Table 3.6: Results for LyS-DT with variable threshold. Table 3.7: Results for LyS-ES with variable threshold. Table 3.8: Results for ONETA-CA with variable threshold. Table 3.9: Results for ONETA-ES with variable threshold. 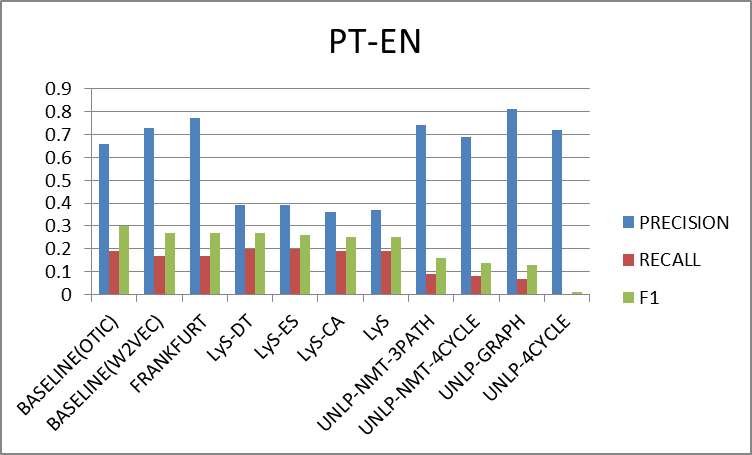 Table 3.10: Results for UNLP-4CYCLE with variable threshold. 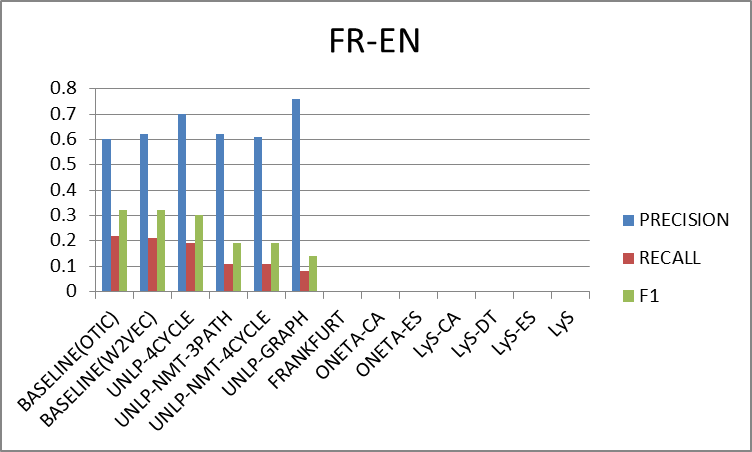 Table 3.11: Results for UNLP-GRAPH with variable threshold. 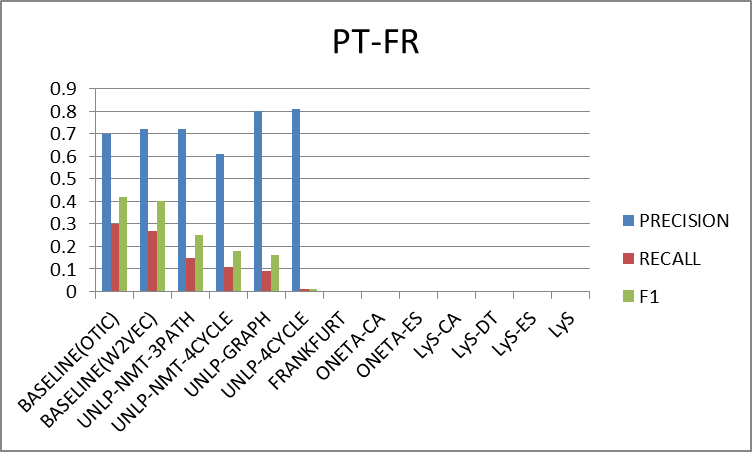 Table 3.12: Results for UNLP-NMT-3PATH with variable threshold. 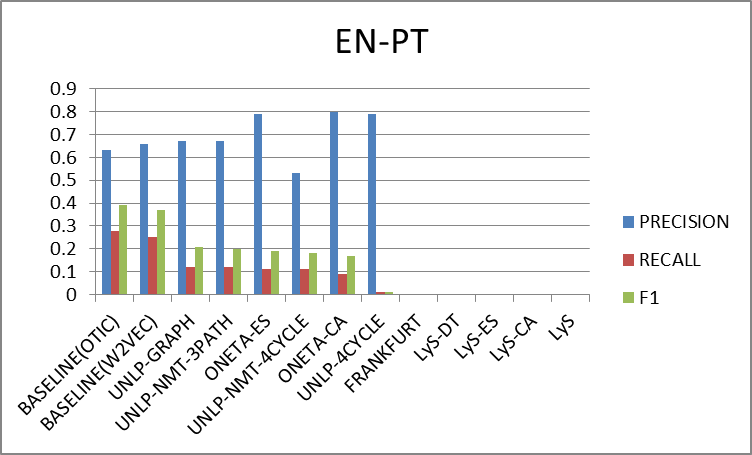 Table 3.13: Results for UNLP-NMT-4CYCLE with variable threshold. 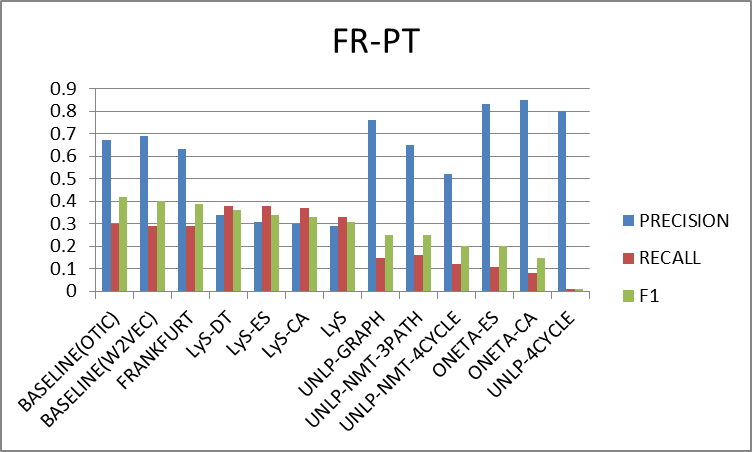 Graph of the systems results (F1) per threshold. Table 5: Average number of translations per system. T. Mikolov, K. Chen, G. Corrado, and J. Dean, "Efficient Estimation of Word Representations in Vector Space", 2013. K. Tanaka and K. Umemura. "Construction of a bilingual dictionary intermediated by a third language". In COLING, pages 297–303, 1994. L. T. Lim, B. Ranaivo-Malançon, and E. K. Tang. 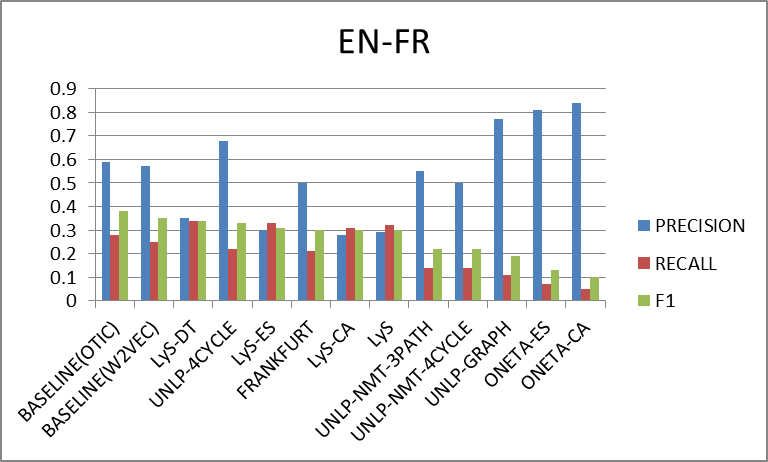 "Low cost construction of a multilingual lexicon from bilingual lists". Polibits, 43:45–51, 2011.